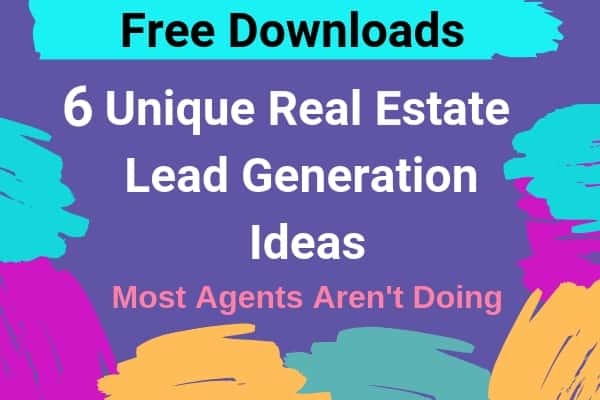 Whether you’re a new agent looking for ways to jump start your business or a seasoned agent/broker looking for ways you can generate more leads for yourself or your team the below are unique real estate lead generation ideas that work and most agents aren't doing them. Perhaps you’re tired of paying for leads in which other agents also receive those same leads. Are you looking for others ways to generate business that gets you leads and a heck of a lot easier than cold calling? Or calling the same leads other agents are calling? Do you ask yourself how can you have a steady stream of ready to go sellers and buyers CALLING YOU? How can you have a consistent flow of people ASKING YOU TO REPRESENT THEM? Asking you for help and guidance? Below are UNIQUE ways to generate YOUR OWN REAL ESTATE LEADS. It's much easier, enjoyable and conversions are higher when you're not competing with so many agents for the same seller and buyer leads. USE THESE REAL ESTATE LEAD GENERATING IDEAS TO HAVE buyers and sellers reaching out to YOU. Have steady commissions coming in by implementing a couple of the systems and real estate ideas below. Creating a consistent system of lead generating strategies will generate a steady flow of leads and referrals. These 6 Unique Real Estate Lead Generation Ideas will bring you a steady flow of leads and clients. But, YOU HAVE TO REMEMBER THEM. Download your checklist now so you don't forget them. Refer back to them whenever you want. 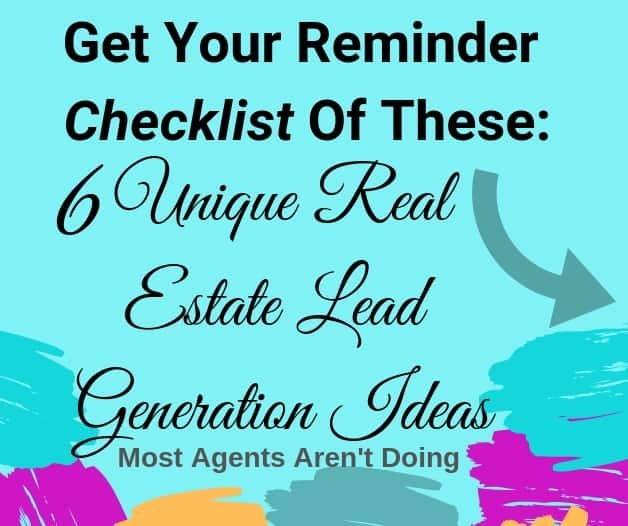 Enter your email below and I'll send you this "6 Unique Real Estate Lead Generating Ideas" now. Success! Now go to your email and grab your Professional Binder Info and Checklist. Spice up your business...Don't forget! When I started as an agent most people I knew already had homes…homes are not something people buy and sell daily. I realized I needed to figure out a way to have buyers who are looking and ready…CALLING ME. It took a LOT OF TIME calling FSBO’s, calling Expireds…sending emails, postcards and marketing material to them…AND EVERYONE ELSE IS CONTACTING THEM TOO! I stepped back and thought about it. What was an efficient use of my time, where I could locate leads…and have people calling me? I needed leads…and needed them fast. I had bills to pay and a business to jump-start! So I searched and searched for different ways to generate my own leads and I stumbled on this lead generating strategy. Any licensed Realtor can market HUD homes. Hmmmm, what is this? I tested and tweaked and learned how to strategically market HUD homes so buyers were calling and reaching out to me. I learned HOW TO CONVERT THEM TO CLIENTS who purchased properties. THIS. WORKED. CONSISTENTLY. I began having a closing a month from this technique. 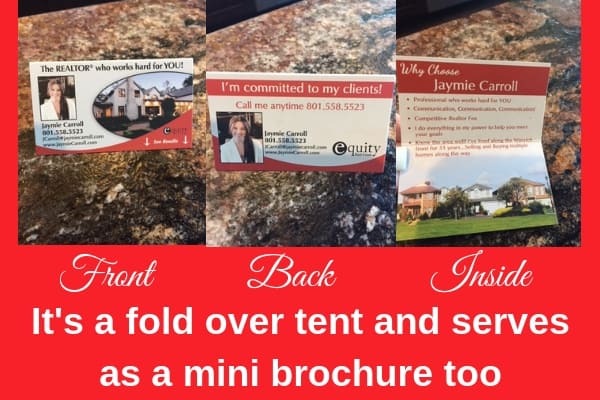 It’s still paying off years later as I have clients coming back to me…listing their homes, helping them purchase more homes and they’re sending me referrals. It’s a domino effect. Take a look at the class where I take you step by step on this technique. Here's mine. It stands upright like a tent. * Get creative. When I hand people my card their eyes open a bit wider, they open it up and they turn my card around and study it. IT LEAVES AN IMPRESSION. I've received SO MANY CALLS from my card over the years. I stumbled on this but it’s brought me so much business over the years. I had a referral and they asked me to sell their grandparents home. They had turned it into a rental and the home was on a well traveled road. I said of course I will. Oh, by the way…my photo is on my listing signs and I highly recommend you do too. I also have my tagline on my listing signs. If you don't have a tagline I recommend you come up with one and place it on all of your marketing materials. I received so many calls from that sign…not only from people curious about the home and people looking for homes…but people I know in the community calling me mentioning they just saw me (on the sign!). This had been a great way to generate leads over the years and also brand/business recognition. I stay top of mind when people see me (my business) all over. People are driving these well traveled roads consistently. Whether it's driving to and from work, driving to their regular grocery store, driving their kids to and from school…these roads are traveled regularly (and daily) by people who will see you over and over again when they travel that road. THIS IS A FREE BILLBOARD FOR YOU! I’ve had people call me from my signs and ask me general real estate questions…and they turn into clients or I get referrals from them. My listing signs on highly traveled roads have brought in many sales…just from the highly trafficked exposure! 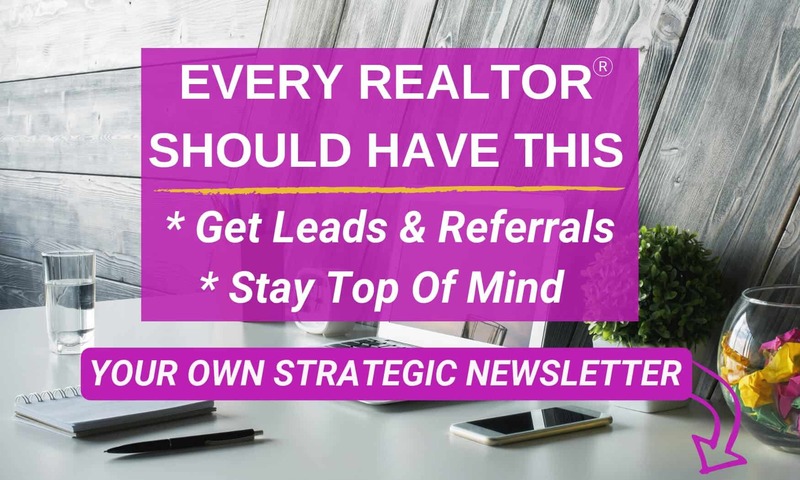 BTW…always get an email address when people contact you and put them on your E-Zine (your super simple strategic realtor newsletter). Offer a free home sellers guide in your packet. Have helpful information that soon to be sellers appreciate and that profiles you as the knowledgeable real estate professional. Have a buyers packet with helpful, professional information that soon to be buyers find useful. Offer gift certificates for referrals that the employees send you…perhaps the employee isn’t buying or selling yet but they know people who are. Offer the packets to the company's employees so they can give these to people they know. *Be sure to follow your state laws regarding referral fees and incentive offerings. Each state has laws in which Realtors must follow regarding the dollar amount for a thank you gift/referral. Offer things of value and/or fun events. Companies are always looking for ways to keep employee morale up and keep their employees happy. * Quarterly lunch events that can be specific for sellers/and or buyers. * Invite other local businesses to provide a lunch or baked goods to the employees of the company. Be sure to include your business card and/or a marketing flyer so they know you’re the one who set this up! You get a WEALTH OF INFORMATION at your planning meetings regarding developments, changes in zoning, upcoming commercial applications. Share what you learn from these meetings with your clients and sphere. This information is GOLD…and most agents ARE NOT DOING THIS. The people you meet at these meetings will be impressed that you’re there and keeping current on your city developments. Agents don’t attend these so you’ll set yourself apart! Network at these meetings. Builders are often in attendance, business owners are in attendance…and the locals are there. Gather business card, phone numbers and email addresses from the contacts you make. Monthly, promote a local business. Profile that particular business in your E-Zine (your professional Realtor Newsletter). Offer a fun raffle and offer gift certificates from that business. 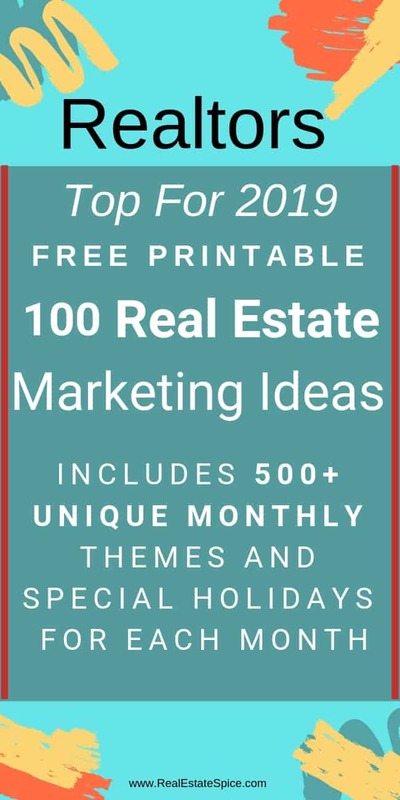 Make sure you get Real Estate Spice's “Unique Monthly Themes Months And Special Dates.” You can use these themes and special dates as a guide to help you decide which businesses you may want to profile. Promote the businesses on social media and in your E-Zine (your monthly Realtor Newsletter). Set up a raffle jar at their place of business where patrons drop in their contact info and can also indicate if they're buying, selling and/or would like to be put on your E-Zine (your helpful, local Realtor Newsletter). The business owner will love you for this, you’re extending goodwill in your community and you’ll be remembered. Forbes explains in “How An Agent Can Claim A Territory In Real Estate” how you can OWN a territory and highly recommends developing relationships with local businesses. Employ one or all of the real estate lead generation ideas above. Create systems in which you stay consistent with a particular lead generating strategy. Consistency is key to having a steady flow of real estate leads coming to you! Implement the above and watch a steady stream of leads and commissions flow to you!